The City Manager continues to oversee a three-pronged approach to reducing JWA impacts — an approach that appears to have never been formally discussed, endorsed or budgeted by the full City Council (see October 10, 2017, entry under “Recent Events,” below). The approach consists of promoting higher, quieter, less polluting flights through a combination of: (1) collecting and analyzing technical data on existing versus potential noise levels, (2) lobbying legislators and air carriers in Washington, DC, and (3) placing public pressure for change on the air carriers through a coordinated public relations campaign. Most recently, the City mailed to some 45,000 households a printed newsletter describing its JWA efforts, and conducted an on-line survey regarding resident knowledge of, and concerns about, the airport (see July 20, 2018, entry under “Recent Events,” below). Meanwhile, JWA does not appear to be actively pursuing its efforts to get SPON to agree to an amendment to the Settlement Agreement that would allow larger commuter planes. However, the draft Environmental Impact Report for JWA’s planned General Aviation Improvement Program was posted for public review on September 20, with the deadline for comments originally set as November 6, but extended to November 21. A public presentation about the EIR, with an opportunity for public comment on it, was provided at the JWA Administration building on September 26 at 5:00 p.m. The City submitted a comment letter on November 14. Responses to the comments were posted on April 9, and per the announcement that accompanied that, after a preliminary review by the JWA Airport Commission on April 17, and a recommendation on May 1, the County Board of Supervisors will consider certifying the EIR and choosing a project (for among the alternatives studied) on May 7. Staff reports for both have been posted (see Upcoming, below). Project Overview: Orange County’s John Wayne Airport has long been cited as one of the greatest continuing threats to the quality of life in Newport Beach. Although a convenient travel option for residents and businesses, it brings unwanted noise and pollution. Why We Were Watching: SPON’s concern with the airport dates almost from our organization’s inception and is memorialized by SPON’s role as a signatory to the 1985 Settlement Agreement, and each of its extensions. Since 2002, many of SPON’s concerns have been championed by AirFair, a regional political action committee focused on containing JWA’s impacts. Although there is perennial concern in the community about flight paths, SPON tends to stay away from issues whose solution will benefit one area at the expense of another, and focuses instead on efforts benefiting all residents: seeking fewer, higher, quieter and less polluting flights. SPON is particularly concerned about the as-yet-to-be-finalized General Aviation Improvement Program, which could significantly alter the mix and number of small jets, unregulated by the Settlement Agreement, flying out of the airport. A decision on the General Aviation Improvement Program is listed as agenda Item 35, but the matter is expected to be postponed to the May 7 meeting. Note: this is a continuation of the “Special Meeting” on the same subject held on April 17. The Airport Commission is expected to review and make a recommendation regarding the EIR and project alternatives for the General Aviation Improvement Program. Their recommendation is expected to go to the Board of Supervisors on May 7. This is expected to be the same as what was originally scheduled as agenda Item 35 at the April 23 meeting. See that for details. There is no advance agenda for these meetings, but they offer a chance to talk with JWA Noise and Access staff about the state-required quarterly Noise Abatement Reports and other JWA issues. April 17, 2019: As Item 5 at a well-attended special 5:30 pm meeting (see agenda here), the County Airport Commission heard a staff presentation and public testimony regarding the EIR and project alternatives for the General Aviation Improvement Program. A recommendation to the Board of Supervisors regarding the matter was postponed to the Commission’s next regular meeting on May 1. April 15, 2019: The City’s Council-appointed Aviation Committee met in the Friends Room at the Central Library to hear about various airport issues, primarily the proposed JWA General Aviation Improvement Program. See agenda here. April 9, 2019: JWA posted responses to some 300 comment letters it received regarding the General Plan Improvement Program EIR. The announcement outlined next steps and future hearing dates. April 6, 2019: An overflow audience turned out for a two-hour JWA Town Hall in the City’s Community Room hosted by County Supervisor Michelle Steel and Newport Beach Mayor Diane Dixon (see City video here — there is also a privately produced video of the entire meeting from Barry Friendland of Costa Mesa Briefs, accompanied by a video of interviews with attendees). The County’s PowerPoint presentation has been posted here. March 20, 2019: JWA staff conducted its state-required Quarterly Noise Meeting in the airport administration building. The Noise Abatement Reports for the last quarter of 2018 (normally due by March 16 at the latest) has been delayed by the 30,000 noise complaints received during the quarter, largely as the result of community members with automated aviation noise reporting “clickers.” The report is expected to be posted in a few weeks. JWA will be instituting a more automated noise complaint logging system over the next few months. Citizens will be required to enter information directly into the system through either desktop or mobile phone “app” or a “telephone tree,” rather than relaying the information through JWA staff. As part of the contract, JWA will also be posting detailed monthly noise spreadsheets, listing for public viewing all the noise events observed at each noise monitor during the prior month. These will be produced by the same vendor, and therefore very similar to, those posted by the Metropolitan Washington (DC) Airports. March 4, 2019: The City Aviation Committee met. It voted to recommend General Aviation Improvement Program Alternative 3 to the City Council, and to downsize the Committee from 23 members to 15 by eliminating the 7 district alternates and consolidating the SPON and AirFair delegates into a single position. November 21, 2018: was the deadline for submitting comments on the General Aviation Improvement Program EIR. See Notice of Availability for details, and Notice of Extension of deadline for comments. JWA is required to respond in writing to comments received by the deadline. Comments can continue to be submitted after the November 21 deadline, but JWA does not have to respond to those. November 14, 2018: The City submitted a comment letter on the General Aviation Improvement Program Draft Environmental Impact Report (see September 26, 2018, below). November 5, 2018: The City Aviation Committee met in the Central Library’s Friends Room to discuss John Wayne Airport issues. The agenda is here. This was the first meeting since June 18, and the next meeting is expected in February, on a date yet to be announced. September 26, 2018: JWA provided a public presentation about, and opportunity for the public to comment on, the recently released Draft Environmental Impact Report for the proposed General Aviation Improvement Program. The proposal is likely to change the future mix and number of non-scheduled jets taking off over Newport Beach. September 25, 2018: As Item 16 on its agenda, the City Council approved adding $30,000 to contract C-7292-2 with HMMH (see February 18, 2018, below). This request to pay for additional analysis that had been performed by HMMH in studying the effects of alternative departure paths and procedures is the first time one of the airport-related contracts appeared publicly before the Council for approval, presumably because the new total contract cost exceeded the City Manager’s signing authority. The payment for work already performed appears also to have been granted in violation of Article XI, Section 10 of the California Constitution. The results of the departure studies have not been publicly released. September 20 , 2018: JWA posts Notice of Availability of draft Environmental Impact Report regarding their proposed General Aviation Improvement Program. The GAIP offers several alternatives for reconfiguring the layout of planes and hangars on the airport property, in part to accommodate a larger number of unscheduled jet flights, unregulated by the Settlement Agreement. September 12 , 2018: JWA Quarterly Noise Meeting held at JWA headquarters with five members of the public from Tustin in attendance in addition to five from Newport Beach. Those living under the arrival path in Tustin were particularly vocal about the increased impacts of aircraft noise on their quality of life. July 20, 2018: City posts a News Splash announcing the mailing of a Community Newsletter regarding JWA issues, as well as an online survey polling recipients on a number of questions. June 18, 2018: -The City’s Aviation Committee held one of its rare meetings in the Civic Center Community Room adjacent to the Council Chambers. The agenda appeared to indicate the Committee would be hearing a report from the City’s consultant, HMMH, on the results of their analysis of the pros and cons of various departure procedures. This turned out to be only an update from outgoing City Manager Dave Kiff on the status of HMMH’s work on the contact items. He said HMMH had completed its study of noise data from departures flown by Alaska, American, United and Southwest Airlines from October through January and had compared the data to an FAA noise model. They would next be asking if any of the carriers were doing things that could be applied beneficially to the others, with a conclusion about that due by the end of July. Finally, they would be asked if there is a beneficial new and currently unused procedure that could be suggested to the FAA as a replacement for one of two alternatives currently approved. That conclusion is expected in August or September, to be followed by the “big ask” to the FAA and carriers to adopt it. In the preceding, “departure procedure” refers not to the flight path or ground track, but rather to the height and speed with which the aircraft ascends over the ground track. June 13, 2018: JWA Quarterly Noise Meeting held at JWA headquarters with just four members of the public in attendance. JWA staff called attention to the Metropolitan Washington (DC) Airports Authority’s noise reporting, which, since 2015, has posted for the public in spreadsheet form information from the noise sensors at the Reagan National and Dulles International Airports. These provide both monthly summaries, giving various statistical measures (such as minimum, maximum, and mode), and detailed listings of every sound event at every monitor, identified by aircraft or as a “community” (non-aircraft) event, along with the background noise levels observed between events. Equally importantly, the DC airports measure events with lower loudness levels and shorter durations than other airports (including JWA), which is important if they are to continue to accurately gauge aircraft impacts as planes become quieter but more numerous (JWA logs and reports only events that exceed 65 dB for 10 to 60 seconds). June 13, 2018: City posts HMMH report on side-by-side noise testing (conducted December 2017 through January 2018) on the Aviation Committee’s Special Reports page. HMMH took readings at two JWA noise monitor locations, and at three locations not normally monitored by JWA. May 22, 2018: As Item 15 on its agenda, the City Council approved an extension of its contract for airport consulting with former Council member and Mayor Tom Edwards. May 4, 2018: On short notice, the City held a Friday Aviation Forum in the City Council Chambers at which the delegation from the recent Washington, DC, trip debriefed the public on the results of their effort. The City has posted the PowerPoint shown by the City Manager. April 24-27, 2018: A delegation consisting of City Manager Dave Kiff, Deputy City Manager/Public Information Manager Tara Finnigan, and Council Members Herdman, Dixon and Muldoon flew to Washington, D.C., to introduce themselves to the City’s lobbyist at Buchanan, Ingersoll and Rooney (see January 23, below), and visit various congressional and FAA offices. It is unclear who appointed the delegation, or who authorized the travel, as there was no Council or Aviation Committee discussion of it. April 19, 2018: City Manager signs contract C-7391-1 with Probolsky Research to convene two 90-minute focus groups of 12 or more people each regarding outreach to FAA and air carriers relative to quieter departure paths. March 29, 2018: First “STAYY” departure using the FAA-approved curving path over the Upper Bay that the City had long lobbied for. Preliminary results were provided in the City’s April 2018 Monthly Report. March 14, 2018: The JWA Quarterly Noise Meeting was held at JWA headquarters. March 9, 2018: The City held a Friday Airport Forum in the City Council Chambers. As the third of three presentations from them, the JWA Access and Noise Office explained the process by which the limited commercial capacity at JWA is assigned, each year, to the various carriers under the Access Plan. February 12, 2018: The City Aviation Committee met (agenda), with Councilman Herdman (Chair) out sick and the JWA personnel on holiday. Results from the City’s independent noise monitoring (see December 1, below) are not yet available, but may be by the next meeting, likely in April. On the same day, the City Manager signed contract C-7330-1 with Dynamic Strategy Group for public relations/outreach assistance in approaching and influencing air carriers. February 9, 2018: A Friday Airport Forum was held with JWA Access and Noise Office staff providing the second of three presentations from them, this one about the Settlement Agreement and Access Plan. February 8, 2018: City Manager signs contract C-7297-2 with HMMH for updated study of departure pattern alternatives (promised as part of Resolution 2017-63 from September 26; see also December 1, below). January 26, 2018: A Friday Airport Forum was held with JWA Access and Noise Office staff giving a “Noise 101” presentation detailing how aircraft noise is monitored and reported. January 19, 2018: US Department of Justice signs agreement concluding City’s lawsuit against the FAA’s NextGen/Metroplex Project. The agreement has been posted and can be viewed as City Contract No. C-7291-1. It encourages trials of an “S-curve” departure, and promises City and public review of any future changes to flight paths. January 9, 2018: The City has announced a tentative agreement with the FAA resulting from mediation over the FAA’s handling of their Environmental Impact Statement regarding the new GPS-controlled NextGen flight paths. The settlement (the text of which has not yet been released) purportedly involves a number of deal points favorable to residents, as detailed in the City announcement. SPON was supposedly invited to participate in the mediation, but to the best of its knowledge was not informed of that opportunity. December 13, 2017: The JWA Quarterly Noise Meeting was held in a new format, with Noise Office staff giving PowerPoint presentations to the public in attendance on various topics of interest, followed by an open question and answer period. December 11, 2017: the City Aviation Committee met. The announced topics (see agenda) included possible implementation of a “Fly Quiet” program, encouraging airlines to reduce noise impacts, although nothing concrete appeared to decided regarding that. December 8, 2017: Aviation Committee Chair Jeff Herdman and City Manager Dave Kiff held their second informal community get-together regarding JWA issues in the City Council Chambers from 3:00 to 5:00 p.m. Mr. Herdman collected sets of four questions from members of the audience and Mr. Kiff attempted to answer them. December 1, 2017: City Manager signs contract C-7297-1 with Harris Miller Miller & Hanson, Inc. (“HMMH“) for independent monitoring and verification of aircraft noise levels (see October 10, request #2). November 30, 2017: Council member Diane Dixon held a town hall on NexGen issues for Peninsula residents at Marina Park from 7:00 to 8:00 p.m. The City’s online calendar has twice listed a “Community Forum on John Wayne Airport,” apparently featuring work done by AWG. It was first listed for November 15 and then for December 6. Both times the listing disappeared without the event happening. November 17, 2017: Council member (and Aviation Committee Chair) Jeff Herdman and City Manager Dave Kiff held the first of planned periodic opportunities for informal discussions about airport issues. The meeting, as will apparently be the pattern, was held in the City Council Chambers from 3:00 to 4:30 p.m. on a Friday afternoon. October 30, 2017: The City’s Aviation Committee held one of its rare meetings. There was some talk of the City instituting a “Fly Quiet” incentive program, but little concrete happened. October 10, 2017: Under Item XIII, the City Council unanimously directed City staff to return with future agenda items regarding two matters proposed by Mayor Muldoon: (1) “Seeking the assistance of a federal advocate to work with the City on FAA and related aviation matters, including communication with major air carriers,” and (2) “Supporting additional review and verification of data accuracy from the County of Orange’s seven noise monitoring stations on the JWA departure corridors.” Those items do not appear to have ever been placed on a Council agenda, yet contracts for executing them were signed by the City Manager on December 1, 2017, and January 23, 2018 (see those dates in this list). October 6, 2017: Following on the September 15 event, AirFair hosted a second, even better attended public forum. Mayor Kevin Muldoon, Council member Jeff Herdman, City Manager Dave Kiff and City Attorney Aaron Harp presented and fielded questions. September 15, 2017: AirFair hosted on a public forum on JWA issues at the Newport Beach Tennis Club in Eastbluff. In 2018, JWA again approached SPON inquiring whether its position regarding the commuter aircraft definition had changed, but seemed less aggressive about demanding an answer. In 2017, JWA approached SPON and the other signatories with a second request to amend the recently-extended Settlement Agreement, this time to increase the allowed number of seats on “commuter” aircraft from 70 to 76. Although the change seemed very small, SPON was not convinced of the airport’s claim that this would reduce noise, and was concerned that it would instead lead to the present Settlement Agreement limited number of passengers being placed on a larger number of planes, each as noisy as the present ones carrying more. In addition, SPON was concerned about a rumored threat by Southwest Airlines to attempt to invalidate the Agreement in its entirety if the change was made. The airport tabled the matter after SPON requested indemnification, but it is likely to return in 2018. In 2015, SPON reluctantly agreed to minor increases in the noise levels allowed by the Settlement Agreement at the airport’s seven automated monitoring stations in Newport Beach, supposedly necessitated by the installation of newer, “more sensitive” microphones. In 2014, SPON completed negotiation of the second of two extensions of the historic JWA Settlement Agreement. This one limits commercial jet operations through 2030. The previous extension, signed in 2003, would have expired in 2015. 2003: Settlement Agreement extended, but allowing still more expansion of terminal facilities and jet flights. Out of disappointment with the negotiations, in May 2002, AirFair was created as yet another issue-oriented outgrowth of SPON. 1985: Settlement Agreement reached to resolve disputes over new 1985 Master Plan and related EIR 508, as well as EIR 232 (see “Helpful Links,” below). 1981 or 1982: SPON joins City lawsuit challenging the February 18, 1981, certification of Environmental Impact Report (EIR 232) related to the County’s Master Plan for airport expansion (see “Environmental Documentation,” below). The Airport Working Group was later formed as an issue-specific outgrowth of SPON, which joined the lawsuit and participated in the negotiations. October 7, 1968: First day of Air California 113 passenger Boeing 737 (“Sunjet”) service from Orange County Airport. August or September, 1967: Bonanza Airlines adds 72 passenger DC-9 “Funjets” (the first regularly scheduled jets, and probably the first jets of any kind to fly from JWA) to its existing Fairchild F-27 turbo-prop service. The City protested the overflights and tried to convince the County Board of Supervisors (which controls the airport) to look for a different location for commercial aircraft activity serving Orange County. Litigation over impact of jet flights begins in 1968. 1952: Bonanza Airlines initiates commercial airline service from Orange County airport with DC-3 (propeller) flights to Los Angeles, San Diego, El Centro-Yuma and Phoenix. JWA’s Settlement Agreement page, including key terms. Many of the features of the Settlement Agreement, including the commercial aircraft curfew and general aviation noise restrictions (which both pre-existed but are protected by the Agreement) can be found in Title 2, Division 1, Article 3 (“Airport Noise”) of the County’s codes, collectively referred to by JWA administrators as the GANO. Regarding the curfew, the Settlement Agreement has always referred to “County Ordinance 3505 [the original GANO], and the provisions of paragraph 4, at page 62, of Board of Supervisors’ Resolution 85-255 (February 26, 1985)” — protected for 5 years beyond the rest of the agreement. Those documents can be viewed here. JWA Historical Chronology of airport development and airport-related events. City Manager’s January 23, 2018, Letter to the Community regarding airport issues. 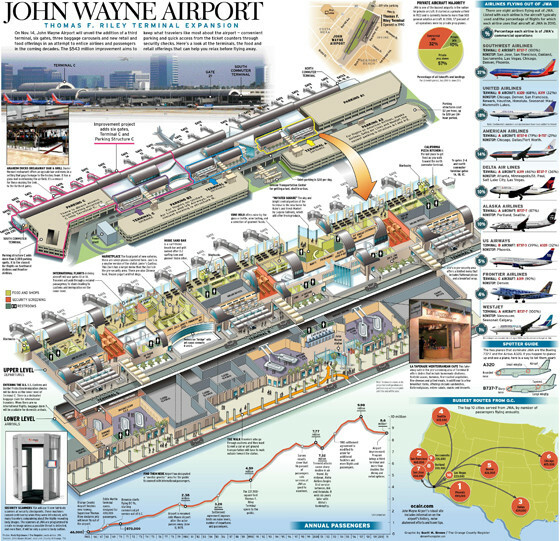 City’s JWA Special Reports page contains a growing list of airport-relevant documents arranged chronologically, with the oldest at the bottom. These include the “ARTS” study of departure options prepared for the City in 2008 and the so-called “Spheres Agreement” with the County from 2006 which, if honored, contains promises limiting extension of the runway to the south (but not to the north). City’s JWA issues page summarizes issues as of mid-2017(?). It does not seem to have been systematically updated since, but it was supplemented by the similar City Manager’s January 23, 2018, “Letter to the Community” (see above). For example, the Issues page mentions preparations for, but not implementation of the new curving-path STAAY procedure. The issues page contains links to “Related Items” at the bottom of the page. EIR 546, from 1993, deals with “The Phase II Access Plan, Noise Limits and Noise Monitoring.” It has been recently posted in four parts on the City’s JWA Special Reports page (see bottom of page). It also seems to be available as a single 118 MB 660 page PDF via a link at the bottom of the City’s JWA Issues page. EIR 573, from 2001, studied splitting aircraft operations in Orange County between JWA and a proposed Orange County International Airport at the site of the former El Toro Marine Corps Air Station. Part of it is available via a link on the Airport Working Group website. Much more was posted by opponents of the El Toro site, and remains available on the Internet Archive’s Wayback Machine. EIR 582 for the 2003 Settlement Agreement extension (which allowed massive expansion of the terminal) is available in print at Newport Beach Public Library , including a 2004 Supplemental EIR for terminal construction. A scanned copy of the latter (only) is available on the AWG website. EIR 617 for the 2014 extension: draft online at JWA (with explanation here); in print at Newport Beach Public Library (draft and final). There is also an associated Mitigation Monitoring Program listing tasks to be accomplished after adoption of the extended Settlement Agreement. See also the County’s certification of this EIR with Resolution No. 14-084. This entry was posted in Watch List and tagged aircraft noise, AirFair, airport, flight paths, john wayne airport, settlement agreement on September 24, 2017 by Jim Mosher.